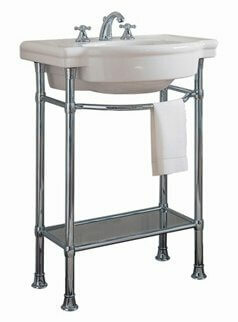 American Standard makes two sinks suitable for pre-war homes that have a “wash-stand” feel. 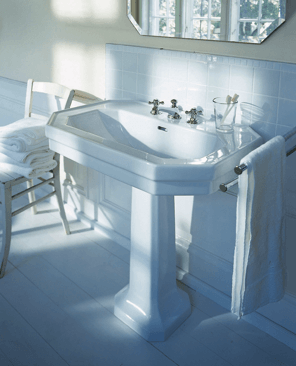 Their “Standard” collection sink (shown at left) sits on chrome legs, with a small storage area below, and flanked by integral towel bars. 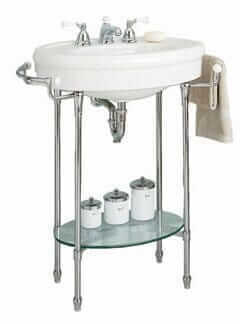 Meanwhile, they also have the similar “Retrospect” sink that sits on either chrome legs or on a custom wood stand (below). Note, I do not tend to think that these are true reproductions, although I could be wrong, as I have not spent even 1% of the time with pre-war archival materials as I have with post-war stuff. This sink — by Strom Plumbing — on the other hand, is super-typical (I think) of bathroom sinks in homes from 1910s, 1920s, 1930s, and 1940s. All that said, these American Standard designs do have a great look — and it’s real hard to argue with the storage and those cute towel bars. Just adding to this post as I went to a vintage plumbing shop just yesterday (Hippo Hardware, Portland, Oregon) and quizzed the very knowledgeable staff. 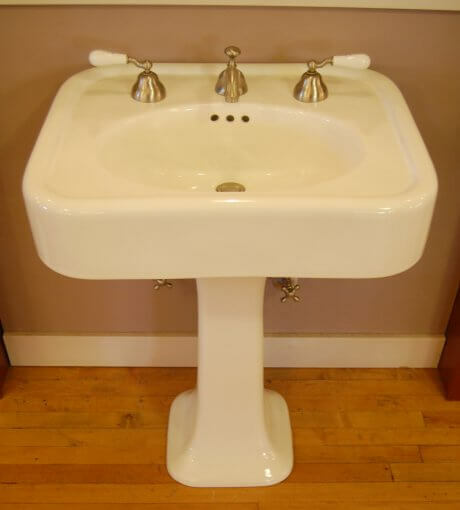 From early 1920s to about 1926 you see the very rounded rectangle sinks on pedestals where the “counter” space on the top around the basin is several inches all the way around. Circular bases only. By 1927-1930 the rage was the squared corners and square bases. Of course, they are still a little rounded, but more of the octagonal designs and edges. This is more like some of American Standard’s other pieces. By the 1930s depression era you got similar ones to what we see from Am. Std. — a sink that is stuck to the wall, but supported from the front only or on all four sides by chrome legs. I am glad I found that out as I have a 1924 bungalow and have been working on taking it back to the 20s after the last owner took it into the 70s. Not that I plan to be a strict period person, but good to know. They recommended that if you’re taking your house to it’s building period that it’s okay to do stuff *before* the building date, but not after. So you can have Victorian styling in a 20s home, but don’t do 30s or 40s in a 20s home. I’m happy as long as I stay away from the mid-century modern look. 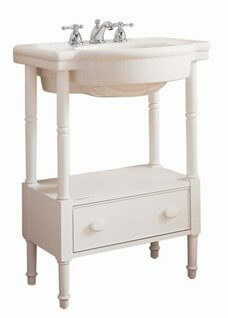 So: Couldn’t find anything in new brands that fit the true early 20s, but Kohler and Barclay have some late 20s styles. Of course this poster found the 30s styles out there. I also found out that for another couple of hundred bucks I could buy an actual vintage sink all replumbed for ~$400. Yes, it’s probably another $150-$200 than you wanted to spend, but how often do you buy a sink? KD, check out deabath.com, too. John the sales mgr is very knowledgeable and they have lots of cool vintage stock. Disclosure: They are an advertiser, but I would recommend them anyway. Note, I can’t find the first one (the Standard) available anywhere anymore – it may be discontinued.